Union is a community leader in reducing gun violence. As Rep. Eric Swalwell’s guest to Tuesday’s State of the Union, Fremont Police Chief Richard Lucero is described as a regional leader in reducing gun violence. However, Lucero is also one of the most fervent backers of government surveillance in the East Bay. And one of the few in an area adverse to such intrusion in their lives to have successfully implemented their plan. Since becoming Fremont’s permanent police chief in 2013, Lucero has successfully pushed for up to 10 surveillance cameras positioned around the city’s freeway entrance and exit points. But, even with Fremont’s somewhat pliant and conservative city council, it took some time to find the proper funding for the cameras. When it was first introduced, a city staff report admitted the proposed use of the cameras was to monitor Fremont’s “low-to-moderate” neighborhoods by tracking vehicles containing individuals suspected to be committing crimes. At the time, the police department’s wish list was for up to 20 surveillance cameras in a city with a relatively low crime rate. Lucero even told the council the cameras do little to deter crime, yet he continued to back the proposal and advocated for the dubious repurposing of Federal Housing Authority funding to pay for the high-definition cameras. The Fremont City Council, although continually supportive of surveillance cameras in their city, balked at the use of federal dollars set aside for housing the poor. But, the cameras were not approved until last July with funding from the city’s Capital Improvement Program. Lucero told the council the police department intends to share information from the surveillance cameras with the statewide data hub known as the Northern California Regional Intelligence Center (NCRIC). Although Swalwell’s record on social issues appears to be progressive, his support for law enforcement in the past has led many to label his politics in a moderate light, which is not incongruent with his bifurcated congressional district that is more liberal in the west and more conservative in the Tri Valley. 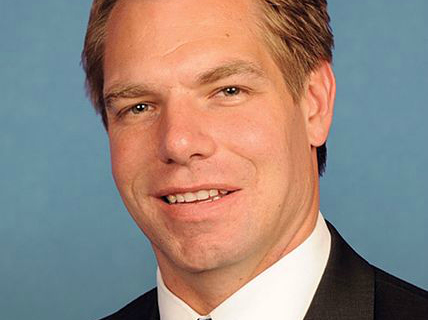 Swalwell’s record on surveillance is more problematic for privacy advocates. In the past, he has given conflicting comments on issues related to all types of surveillance, including an uneven record on government tracking of cellphone data and web histories, in addition, to drones proposed for use by the Alameda County Sheriff’s Department. Posted in Eric Swalwell, Fremont, gun violence, President Obama, Richard Lucero, State of the Union, surveillance, surveillance cameras. Bookmark the permalink. The item writing is so insightful new and in some cases reasons a very beautiful persona in the community in your scalp. Oahu would be the outset As i look at your web site, nevertheless As i is usually very astonished. Go on advertisment as i my business is will probably stopped at browse the app on a daily basis!